This is one of the features in our web site that we hope you will enjoy. 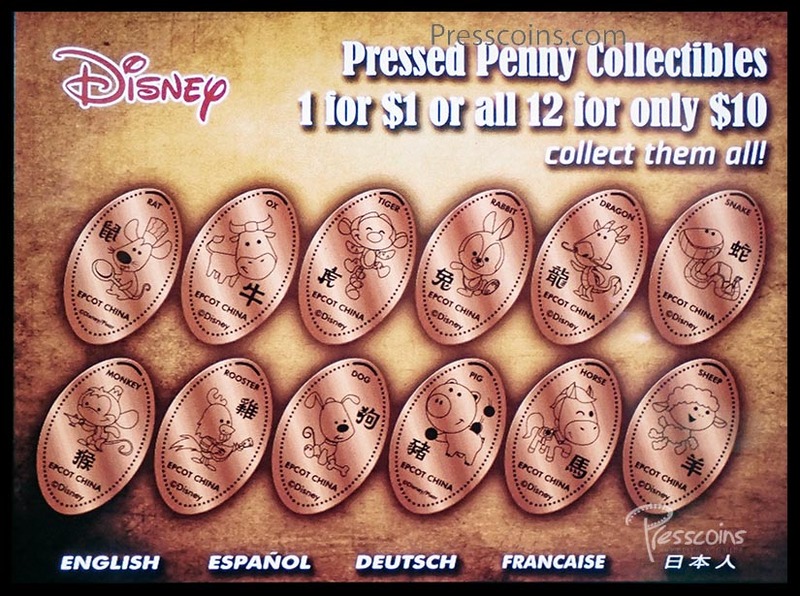 Here in the News Blog you can find out the latest information about Walt Disney World pressed coins. 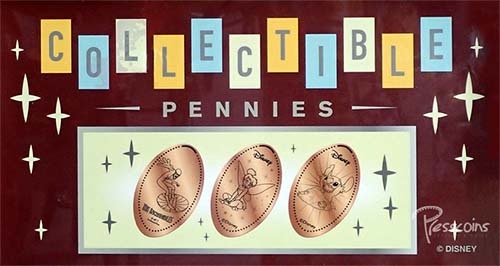 A new 8-die penny machine is now on-stage at Disney's Boardwalk Resort in the Character Carnival gift shop located on Disney's Boardwalk. This new 8-die machine has new designs with Mickey, Minnie, Goofy, Donald, Chip & Dale and Pluto. 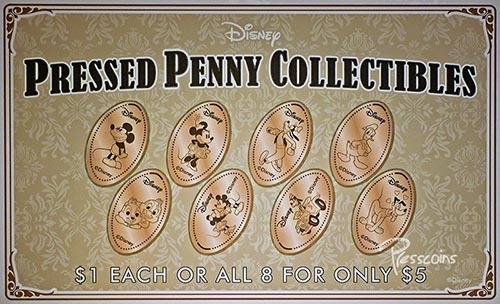 All eight designs have the Disney logos on them at the top along with the usual Disney copyright. A new 8-die machine with Pandora - The World of Avatar themed designs is now available inside Windtraders near the left side entrance door at Animal Kingdom. All eight designs are based on the Avatar Flight of Passage and Na'vi River Journey rides at this park. All designs have the Disney logo and Pandora The World of Avatar logos on them. Utility Suit "Pandora Science Team"
In a recent blog post about a new die with Frozone from The Incredibles numbered series we mentioned that Frozone and Dash were on the same 4-ring die at Once Upon A Toy at Disney Springs. These were the only two characters that were missing from this series when they were removed in August 2017. We had previously posted that a new die with Frozone, 6 of 7 was placed in a machine at PizzeRizzo at Hollywood Studios. Another new die with Dash has been placed in a machine inside Pin Traders at Disney Springs. With the addition of these two new dies it completes The Incredibles numbered series making the complete set available again. The machine that the new die with Dash was put into also has Mr. Incredible, 1 of 7 and Elastigirl 2 of 7 from The Incredibles series. Another design in this machine was Olaf and this design has been replaced with the new die with Dash, 4 of 7. The remaining three designs in this series are Violet, 3 of 7 which is in a machine also at Pin Traders at Disney Springs, Jack Jack 5 of 7 which was another character that was replaced with a different die in 2011 that is in a machine at Disney Traders at EPCOT and Syndrome, 7 of 7 that is in a different machine at PizzeRizzo at Hollywood Studios. In August 2017, the 4-die ring in a machine at Once Upon A Toy at Disney Springs was replaced with new designs. 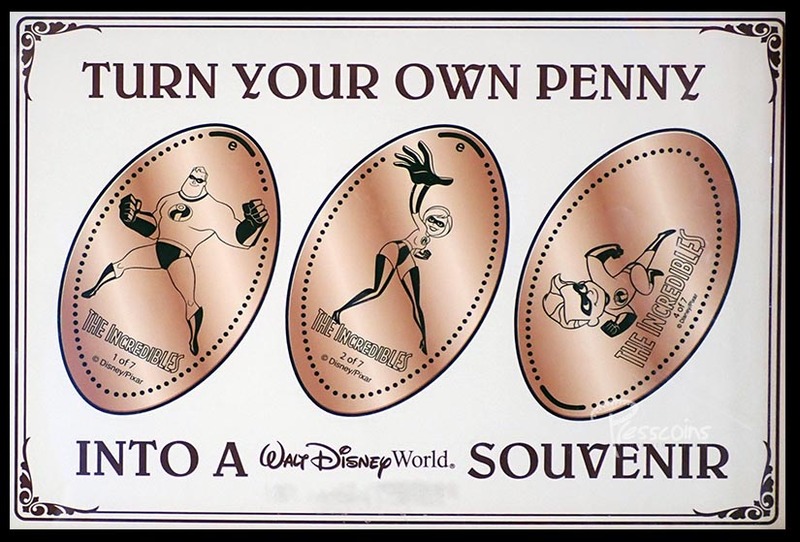 Two of the designs that were on this die ring that was replaced contained two designs from the numbered series with characters from The Incredibles movie. One design was Dash, 4 of 7 and the other design was Frozone, 6 of 7. A new single die has been made with the same Frozone design and has been placed in a 3-die machine at PizzeRizzo at Hollywood Studios. This new die replaces the design with the side profile of Mickey with a movie camera and the Walt Disney Studios logo. Mickey Mouse turned 90 on November 18, 2018. 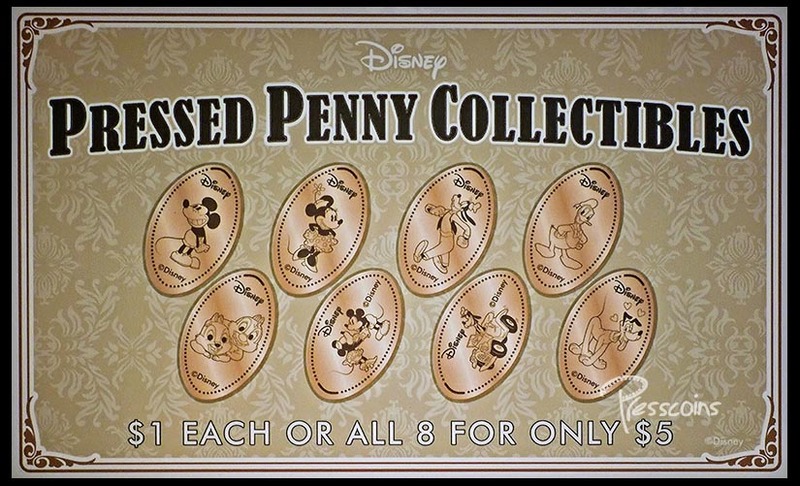 As part of the events and merchandise that is available to celebrate this event, five pressed pennies have recently been placed on-stage at various locations at Walt Disney World. 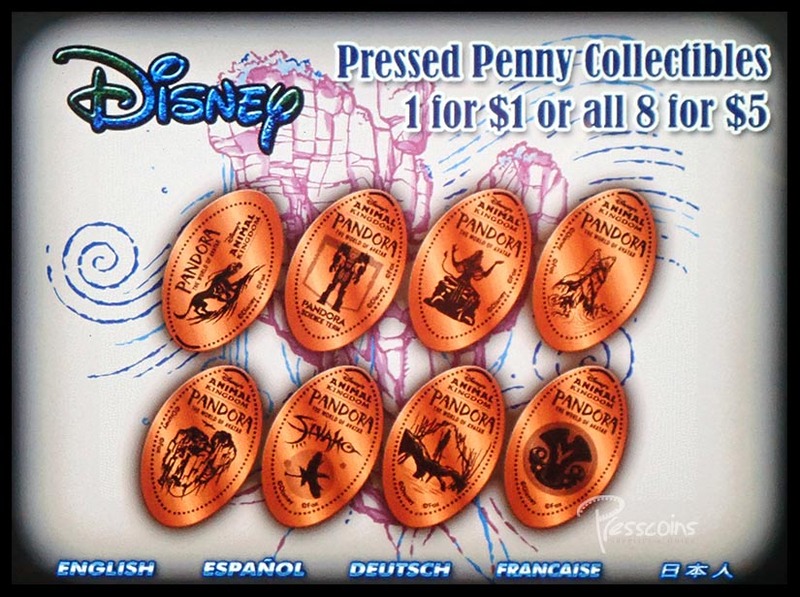 In the picture below the first two pennies on the top row can be found at the Newsstand and in the Verandah Breezeway outside of Island Supply at Magic Kingdom. 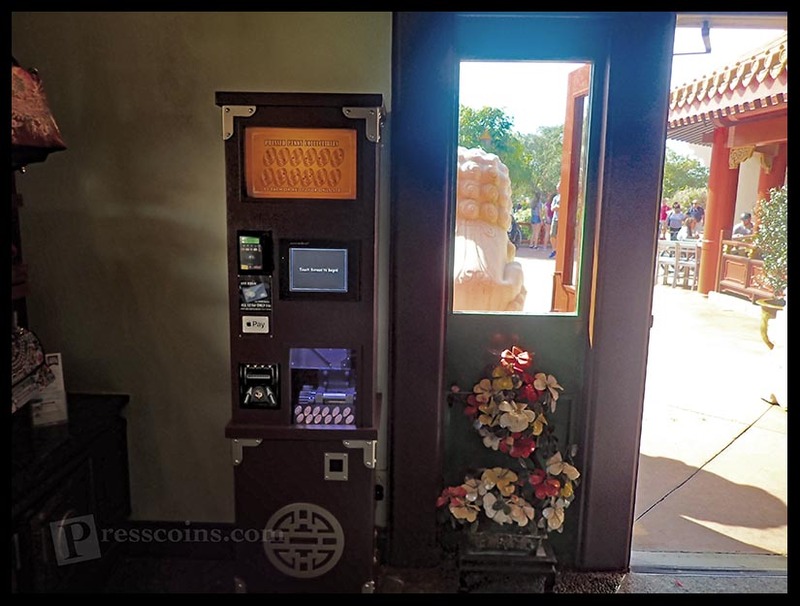 The third coin on the top right is in a machine inside Mouse Gear at Epcot. 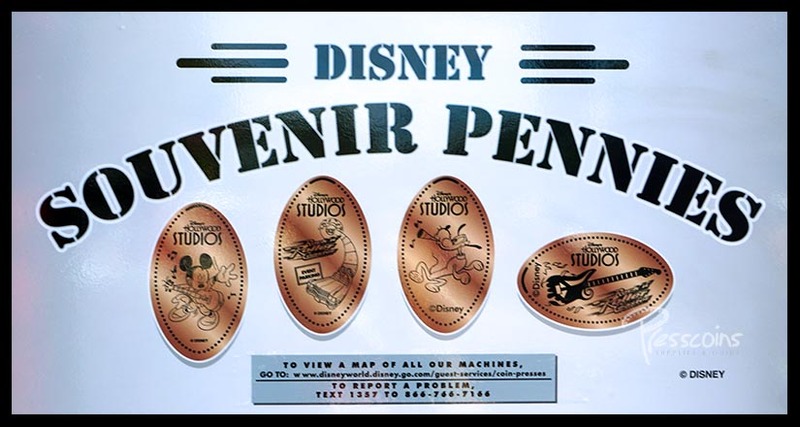 This same machine also has a 2019 penny that was placed on-stage at the first of the year. 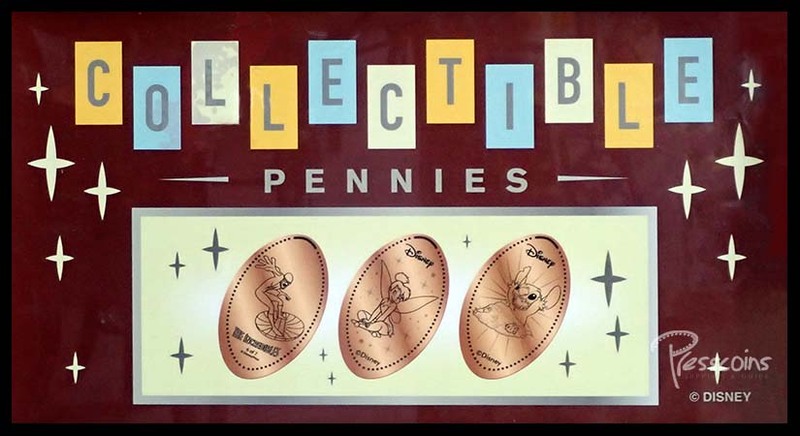 The next two pennies on the bottom row can be found in the Disney Studio Store at Hollywood Studios and inside Disney's Pin Traders at Disney Springs. 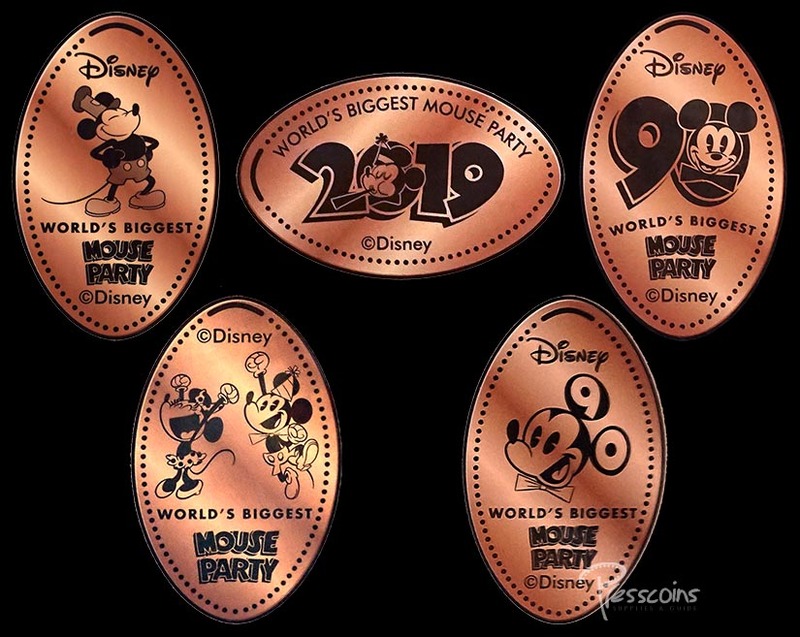 All of these new coins have the wording of "World's Biggest Mouse Party" on them. We will also be treating these new coins as a mini set within the 2019 dated coins since one of these new designs has the year 2019 on it. The Toy Story Mania machine at Hollywood Studios has been removed. It is our opinion that this machine will not be returning and we will mark all four designs that were in this machine as being retired with our next database update. One of the two Rock 'n' Roller Coaster Courtyard machines at Hollywood Studios has a new die ring with two new designs. In checking machines this one would have been very easy to miss since it only looks like one of the designs has changed. The one new design has Pluto blowing a horn instead of Goofy. Closer inspection also shows that the flaming guitar design is different since the size of the guitar and flames are different. Of course, when a die ring is changed all four designs have a different die even though the design appears to be the same. Briefly inspecting the first two designs they appear to be the same as what was originally in this machine. Since we know the die is different even though the designs are the same for the first two designs, we will still assign a new catalog number to all four designs. It appears that the 2019 Minnie quarter design at All-Star Music Resort has had a short life since it has already been replaced. The design that is now at this resort is a new quarter design with Maleficent's Dragon. 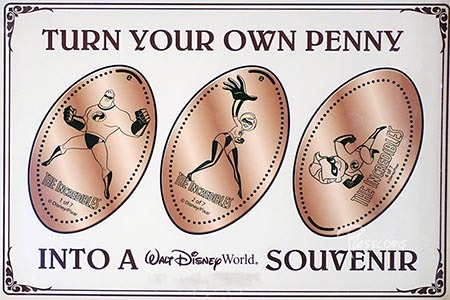 This design is also available as a penny design inside Rock Around the Shop at Hollywood Studios. Our database and all of our checklists and listings were updated today. 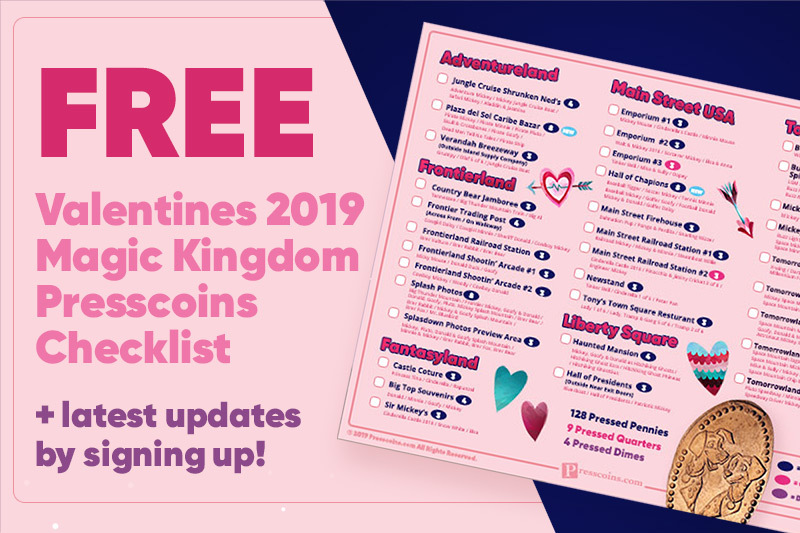 These checklists now show that there are currently 231 machines available at Walt Disney World and other nearby off-site Disney locations. The current available coin count is up to 897 coins comprising of 827 pennies, 4 dimes and 66 quarters. 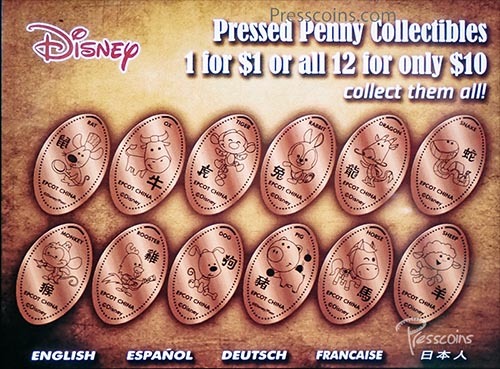 The total cost to get all of the available coins including the coins that you have to provide to press is $543.95. All of our listings are provided for your personal use and they and information on our website is in no way endorsed by Walt Disney Company or the vendor that makes and maintains the elongated coin machines for Disney. 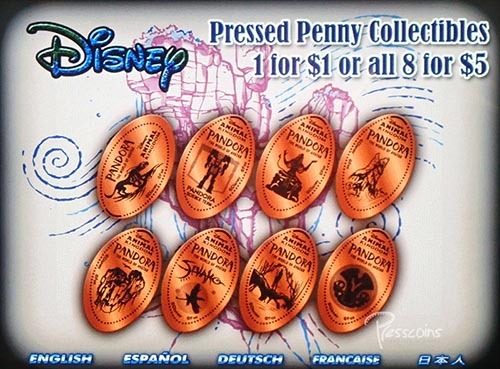 We started posting listings on the Internet over 20 years ago to promote and to help people with collecting Disney World elongated coins. Our desire is to continue to do this for many more years. 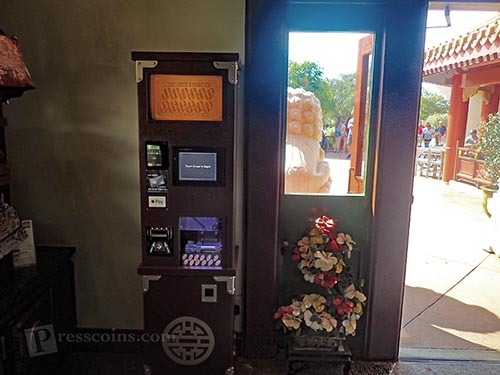 A new 12-die machine is now on-stage at Epcot in the China World Showcase Pavilion in House of Good Fortune replacing the 3-die machine that was at this location. There is a different new design for each of the 12 Chinese zodiac animals that are used to represent years. Each animal on a coin also look like various Disney characters. The year of the Rat has a character that looks like Remy from the movie Ratatouille. The year of the Monkey has an animal that looks like Abu from the move Aladdin. The remaining years also have different animals that look similar to different Disney characters. This year is the Year of the Pig and is the twelfth of the 12-year cycle of animals which appear in the Chinese zodiac. The pig that is on this new design looks like Hamm from the movie Toy Story. All 12 new designs are vertical designs with the name of the animal in English at the top and in Chinese near the animal. At the bottom of each new coin are the words "EPCOT CHINA".